Everyone knows what the Imperial March sounds like but no one seems to know where it comes from.Well, the answer can now be revealed. 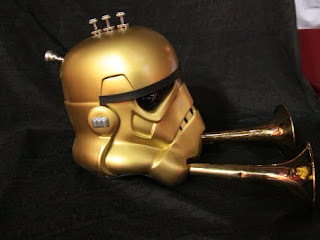 The Brasstrooper. 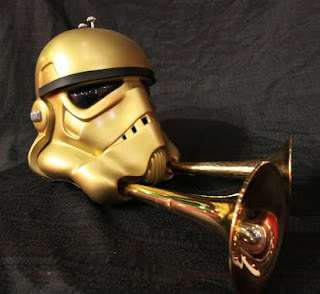 That music you hear is actually Darth's elite marching band that just happens to be slightly offscreen in all of the films. These commando band geeks are trained from birth to follow our favorite Sith Lord everywhere he goes while belting out those famous notes. Able to perform in deep space or in the desert sun of Tatooine, the Brasstrooper is not to be trifled with. In all seriousness, the Star Wars In Concert cast and crew is honored to partner with the 501st in this wonderful project. The Make-A-Wish Foundation is a wonderful organization and we hope our contribution helps make a difference. You don't want to go THEIR band camp. 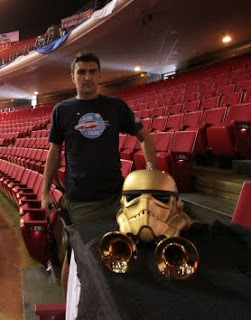 Marching band geeks can get pretty crazy with less adult supervision -- THESE guys just get downright out of control!